Fairmont Palliser features 407 elegant guestrooms on 11 floors. The accommodations feature amenities such as down duvets, bathrobes, and windows that open for fresh air. Guests staying on the Fairmont Gold floor can start with a complimentary deluxe continental breakfast and enjoy refreshments throughout the day. The hotel also features the luxurious RnR Wellness Spa and the Boulevard Club, a first-class health club, to which complimentary access is provided to all hotel guests over the age of 16. Fairmont Palliser has 12 meeting spaces covering 19,000 square feet in which meetings, conferences, and weddings can be held. Event planners are available for any special occasion, as well as packages that include on-site catering and photography. Starbucks is available for guests seeking a quick cup of coffee, but for those seeking a drink and leisurely dinner, there is the Boulevard. Visitors seeking an adventure near the Fairmont Palliser will be pleased to find the hotel is in the city center. It is just a short ride from landmarks like the Calgary Tower and Canada Olympic Park, great museums such as Glenbow and Telus Spark, and the Calgary Zoo. Visit Calaway Park, Canada’s largest outdoor amusement park, where guests can check out a vast array of rides and attractions. Those seeking a thrill can check out the Calgary Stampede for some rodeo fun. Fairmont Palliser is never more than five minutes away from the best Calgary has to offer. 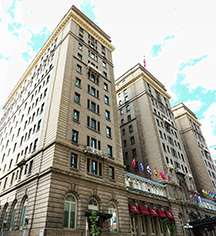 Fairmont Palliser, a member of Historic Hotels Worldwide since 2018, dates back to 1914. Her Majesty, Queen Elizabeth II and Prince Philip have visited Fairmont Palliser on multiple occasions. In the 1990s, they stayed in the most luxurious suite, the 800 square foot Royal Suite - which includes a butler's pantry and dining room that seats 12. Age Requirements: Minimum check-in age is 18. ATM: An ATM is available in the hotel lobby. Cancellation Policy: Cancellations must be made 24 hours prior to arrival unless otherwise stated. Deposit: One (1) night's deposit is required at time of booking. Extra Person Fees: Fees may apply. Hotel/Resort Fees & Taxes: 3% destination marketing fee, 4% tourism levy, 4% GST. Parking: Self-parking and valet are available (surcharge). Payment: All forms of payment are accepted. Pet Policy: Small pets allowed. 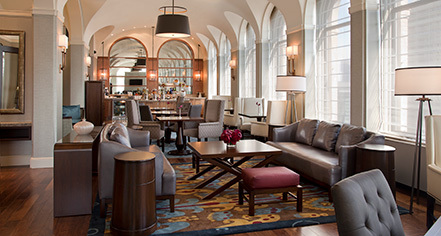 In the midst of a dynamic city, Fairmont Palliser is the Calgary hotel of choice for business and leisure travelers. Since opening day on June 1, 1914, this hotel has provided distinct accommodations in an elegant setting. In 1993, it was awarded the Heraldic Badge by the Crown. Learn more about the History of Fairmont Palliser .